While the elegantly curved Samsung 65HU8500 makes a suitably flashy flagship for the brand's UHD fleet, it's the more affordable Samsung 65HU7500 that piques our interest. Both are 65-inch UHD behemoths, with similar specs, but the flat 65HU7500 wears its inputs on its rear instead of a separate media box, has a slightly slower processor and shaves £500 off the RRP. That seriously undercuts rivals like the Panasonic TX-L65WT600, Sony 65X900A and LG 56UB980V, making it something of a steal, relatively speaking. Big as it is, this is not the largest in the line, which goes up to a colossal 74-inch screen size. And thankfully, the fashion for thin panels and even slimmer bezels means this 65-inch set is only marginally larger than its picture at 1,449 x 833 x 36.4cm and it weighs 24.6kg without the steel stand. So the build quality of the set, what little of it there is to comment on, feels very good. Although the specifications are very slightly lower than the range-topping Samsung UE65HU8500, the features set is virtually the same. Samsung still offers the strongest set of smart features among the TV manufactures, so you can expect to find apps for all of the on-demand channel providers such as BBC iPlayer and 4OD, plus most of the paid-for content providers like Blinkbox at the Samsung Smart Hub. Crucially, you also get Netflix, which is so far the only provider of 4K programming. The panel has a native resolution of 3,840 x 2,160-pixels (UHD) with upscaling for HD and SD material and local dimming especially suited to 4K resolution material. Other hardware features include two remote controls (the fancy one uses Wii-style motion control), two pairs of active 3D glasses, inbuilt Freeview HD and Freesat HD tuners and a quad-core processor. The key connections here are the four HDMI ports, which are all version 2.0, meaning they can all handle a 4K signal at 50/60Hz. Don't forget to check your HDMI cable is up to the task if, like us, your 4K content is coming from a PC via HDMI. Other useful sockets include three USB ports, Ethernet, headphone and digital audio outputs. And while it doesn't have a separate media box like the HU8500, the HU7500 has a spare socket for one, thus future proofing it against new HDMI versions in the same way. It would be disappointing if a 65-inch 4K screen looked anything less than spectacular, so we're relieved to report that the Samsung 65HU7500 does indeed goggle the eyes. And where very large TVs tend to show up flaws and noise when you walk up to them, this one displays a uniformly clean and crisp picture with UHD and even upscaled HD content. Well, our review sample did have one stuck pixel, but the other 8,294,399 looked great. From the box, we did have to make a few adjustments to attain this near-perfection because well-meaning image processing designed to improve the picture actually conspired to make films look like they were shot on HD camcorders with pools of distortion surrounding moving images. It's a simple case of dipping into the menu and knocking down the sharpness setting and turning off the image enhancers, but presumably a slower quad-core processor than that found in the 65HU8500 is to blame for the botched job. More importantly, the upscaling from HD to UHD is handled very well, with hi-def channels and Blu-ray clearly benefitting from the extra pixels. Interestingly, this set evidently found it easier to upscale those confusingly marketed 'Mastered in 4K' Blu-rays because the Total Recall 4K master looked especially detailed and smoothly rendered on this UHD screen. One thing this very darkly lit film highlighted, was how reflective this screen is, despite Samsung's efforts to solve it with the Ultra Clear Panel technology. Standard-def footage proves too much of a challenge for the Samsung's scaler, however, and it simply looks a mess on a TV of this scale. By contrast, 3D films benefit greatly. Samsung has taken the active 3D path here, which means there's no compromise in resolution when you don the 3D glasses and watch Avatar in impressive UHD resolution. Genuine UHD material is still thin on the ground and bandwidth limitations rule out Netflix 4K streaming for most of us in the UK. Feed the Samsung UHD clips and 4K games like Sniper Elite III and you realise what the UHD buzz is all about. And while Hollywood works out how to feed us 4K films, this TV makes a superb photo viewer. We tend to forget just how big snaps taken on a 20MP compact, or a DSLR really are, but with a 65-inch UHD screen you get to appreciate every pixel. In short, Samsung's step-down set gives you the big UHD picture at full 4K resolution without the dubious advantages of a curved screen, or the expense of a separate media box. 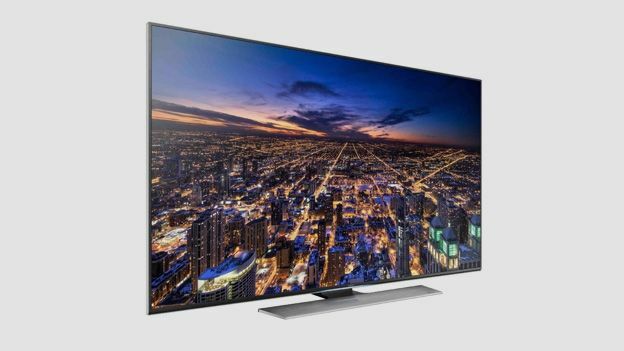 It achieves the same spectacular picture quality we expect from a premium UHD set, so pound for pixel the Samsung 65HU7500 is money well spent, but it's still a huge dent in your pay packet.